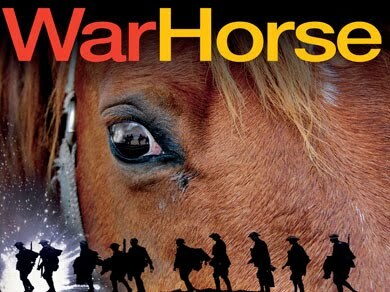 I finally saw War Horse, dear readers. Heading in to the acclaimed new play, imported from London, I wasn’t sure it appealed to me. On paper, it’s about a boy and his horse during war time. And the horse appears on stage as an elaborate puppet. This isn’t exactly my cup of tea. But you know what? It got me. It lives up to the hype and is deserving of all the accolades it’s received. Directed by Marianne Elliott and Tom Morris and adapted by Nick Stafford from the eponymous novel by Michael Morpurgo, War Horse is really about so much more than a boy and his horse. It’s an anti-war play (set against the backdrop of World War I) that’s meant to show the casualties of war, the depths of inhumanity to which we will succumb if we blindly follow our aggressions. And the parts about the boy and his horse are touching. It took me until the second act to really be moved by it (in the first act, I was mostly moved, nay, angered, by the boy’s relationship with his drunkard father), but by the play’s end, I had more than a few tears in my eyes. Overall, it’s a compelling story, though there’s nothing particularly new being said. The storytelling, however, is exceptional, effective and extraordinary. The horses (there’s the main one, Joey, as a foal and a fully grown horse, as well as another fully grown horse) look like real horses on stage. (The horses and other puppet animals are created by Adrian Kohler with Basil Jones for Handspring Puppet Company.) 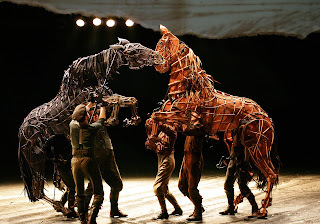 Of course you can see the engineers manipulating the horses (each full-grown horse requires three actors/operators) but the movements and whinnies of the horses look and sound so authentic that the humans quickly meld into the puppet structure and you see a real horse on stage. It’s really a spectacular theatrical feat. And I think it’s the magic of the theatre - allowing your imagination to take over and being in such an intimate space with “real live” horses that makes the experience so incredible. War Horse is playing at Lincoln Center’s Vivian Beaumont theatre and, after critical acclaim and great word of mouth, is now an open-ended run. Visit lct.org for more information and to purchase tickets. Theatre goers 21-35 should visit LincTix.org to sign up for Lincoln Center’s young adults program, through which you can purchase tickets for any LCT show, including War Horse, for just $30. The horses there’s the main one, Joey, as a horse and a fully grown-up horse,war horse tickets as well as one more fully grown horse look like real horses on phase.